The 108th Anniversary Monte Rio Variety Show! The Annual Monte Rio Variety Show marks its 108th anniversary on July 25, 2019. Join us for a special evening of music, comedy and theater to celebrate with Monte Rio and the Russian River communities. All proceeds raised fund local charities. Past shows have featured such stars as Art Linkletter, Merv Griffin, Bing Crosby and Phil Harris and current shows have starred Kix Brooks, Elvin Bishop, Billy Valentine, Tim Nichols, Big Al Anderson and Shelly Berg. Together they carry on the show tradition every July at the Monte Rio Amphitheater surrounded by the towering redwood trees. With a uniquely wide range of acts, from Jazz to Classical, from Country to Rock, the Monte Rio Variety Show has been a Russian River tradition for 108 years. The 108th Monte Rio Variety Show begins at 4:30 p.m. join your neighbors and friends for barbeque, hosted by the Monte Rio Fire Services Foundation; and a fantastic dessert bar, hosted by the Monte Rio School Foundation. Wine and beer is also available for purchase. All proceeds from the food vendors go directly back into the local Community. 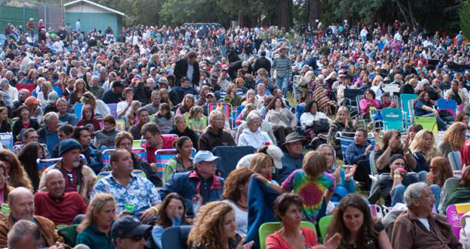 The Monte Rio Amphitheater affords the perfect setting to relax and enjoy top rated entertainment among mature majestic Redwood trees surrounding a gently sloping meadow located in the heart of Monte Rio, California. You are invited to bring your lawn and beach chairs on the day of the show. On the morning of the show, Thursday, July 25th CHAIR SET UP starts at 7:00 am. Chair set up is on a first come, first served basis. The gates close at 3:00 pm and reopen at 4:30 pm when barbeque, desserts and the NO HOST wine and beer concessions are open. Show tickets are $30 per Adult and $15 for Youth (Aged 13-17) when accompanied by a paying Adult. Children 12 and under are free with a paying Adult. To reserve and pay for tickets by mail please fill out this Will Call Request Form 108th. Your tickets will be available at the Will Call desk at 4:30pm on the day of the show. The barbeque begins at 4:30pm next to the Monte Rio Amphitheater. Chicken or Ribs dinner will be served and veggie Burgers will also be available as a meat alternative. Hot dogs, popcorn, baked goods, beer, and wine, will also be offered for sale near show time. All proceeds from the show and barbeque go to benefit St. Catherine’s Church, the Monte Rio School Foundation, and the Monte Rio Fire Services Foundation.